Perfect for a day shoot. Keeps your gear safe from bumps and scratches. VanGoddy branded zipper pulls. Dual zipper pulls for opening and closing convenience. Removable customizable interior dividers. Water resistant. Interior fits a tablet perfectly. Interior mesh pockets make it easy to see what inside the pockets when you're in a hurry. Camera Compartment Dimensions: 12 in. x 8.75 in. x 5 in. Lightweight and compact. Perfect for any Pro photographer or photo enthusiast. External Dimensions: 13 in. x 10.5 in. x 8 in. 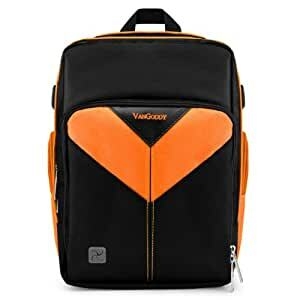 The VanGoddy Sparta DSLR Camera Bag exhibits protection, comfort, and customizability that any photographer can appreciate. The exterior is made of high quality, water resistant materials. There are many compartments and pockets for all your accessories and photographic equipment. This backpack also features an opening for your headphones or other cords and cables that you want access to while leaving your device in the safety and comfort of the bag. The interior contains adjustable walls/shelves that can be arranged to best fit your needs. Take your camera and accessories out into the world with the VanGoddy Sparta DSLR Camera Bag. 4.0 out of 5 starsGreat camera bag! Great camera bag, sturdy, padded, lots of pockets, just wish it was a little bigger.